Pipes, ducts, machines and other air conditioning and plumbing equipment are manufactured using a variety of metallic materials, but these metals corrode, causing fluid leakage, blocking of pipes, and damage to machines. 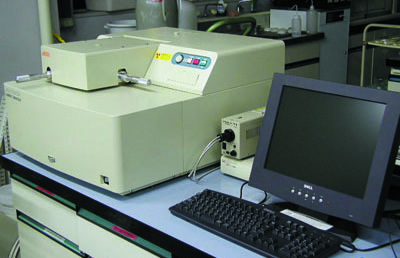 The occurrence and spread of corrosion is influenced to a great extent by the environment in which the materials are installed, so to prevent such problems, Shinryo does research on material corrosion properties in various environments, and performs corrosion diagnostic to evaluate our constructed facilities, thus improving equipment safety and prolonging its service lifespan. Galvanized steel, which is a material that has proven resistant to corrosion in normal usage environments, is the material used most often for pipes in air conditioning equipment. Even so, occasionally, severe localized corrosion may quickly penetrate these pipes causing water leakage. This is assumed to be a result of electropotential reversal of zinc and steel, and despite many past research reports on this phenomenon, its causes have still not been identified. Shinryo is conducting research to clarify the mechanism of this corrosion phenomenon, and to prevent problems caused by similar corrosion. 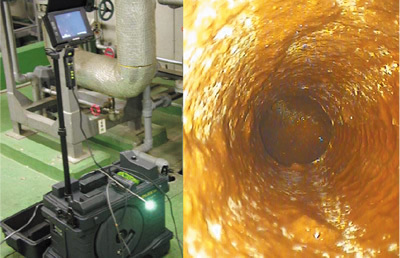 In addition to standard inspections such as using an industrial video-scope to observe the interiors of pipes, we also perform ultrasonic pipe thickness measurements, study sample pipes, carry out inspections using electrochemical measurements, or undertake extreme value statistical processing. 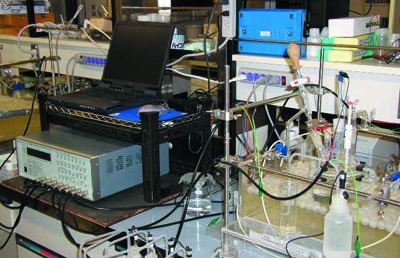 Electrochemical measurements more accurately clarify the state of deterioration of metal by measuring its electric potential, current, and polarization resistance, etc. Extreme value statistical processing assesses safety by predicting the maximum corrosion depth of localized corrosion, which cannot be assessed by inspection done in a limited range. 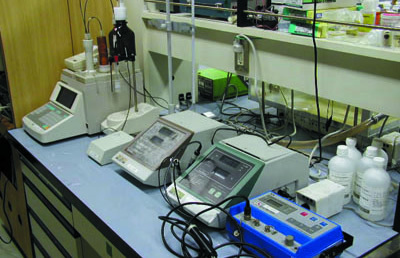 We add the analysis results of products due to corrosion obtained using a fluorescence X-ray analyzer, or information such as temperature, water quality, flow rate, etc., for the circulating water to provide diagnostic results (including causes for deterioration of pipelines and remaining service life) considering combinations of “materials” and “environment”. A database of knowledge gained through these inspections has been built and used to propose ways of selecting materials according to usage conditions, and methods of installing and maintaining these materials.